Reservations: Reservations recommended Fridays and Saturdays. Walk-ins are always welcome. Dress Code: Our venue is casual. Jeans, flip flops, and t-shirts are welcome. We do not allow sports jerseys or tank tops on men, visible tattoos from the neck up, overly baggy clothing, etc. Baseball caps must be worn forward. Our dress code is enforced and at the discretion of our hosts. Cover Charge: Free Admission for Military with ID. Friday and Saturday admission is $8 per person. $10 per person after 8pm. Parking: Metered parking is available on Pine Avenue and surrounding streets. Metered parking is free from 9pm – 9am. We validate for The Pike Parking Structure located at the West end of Bay. The Convention Center offers parking as well as nearby flat rate pay lots located at Pine Avenue and Ocean Blvd. 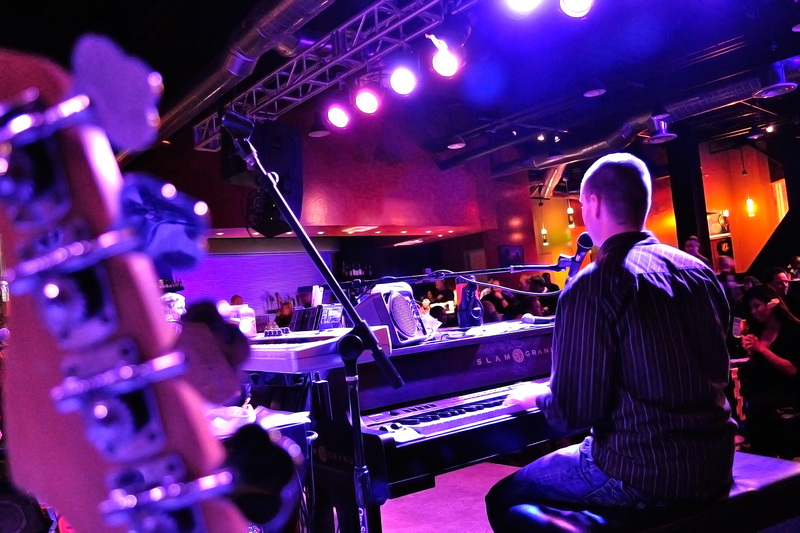 For party-going people looking to spice up their evening, Sgt Pepper's Dueling Pianos offers an exciting, fun-filled, one-of-a-kind experience not to be missed or soon forgotten. Sgt Pepper's features an impressive indoor/outdoor bar designed to accommodate large groups of festive revelers. Singing joyously out loud to the music is not only encouraged, it is almost a law! Patrons have a wonderful time clapping, singing and drinking along with the energetic dual-piano entertainment. This high-energy, popular nightspot is the ideal place to celebrate or just to kick up your heels. Perfect for any reason to party and celebrate, Sgt Pepper's Dueling Pianos offers the ideal ambiance for partying like it's 2099. Showcasing fun piano artists and hilarious humor with the accent on adult, the riotous entertainment here cannot help but bring joyous smiles and laughter to your day. Your next day's water cooler stories will overwhelmingly revolve around your previous evening's fun at Sgt Pepper's Dueling Pianos. Got requests? That's no problem; Sgt Pepper's dueling piano players will bring your favorite songs to life as never before. Patrons and piano players alike will celebrate your good taste in music with a robust energy reminiscent of old traditional English pubs. There are also Karaoke Wednesdays for those who prefer to warble solo. Either way, prepare yourself for classic singalong fun with friends you haven't met yet. And as a result, your smile muscles will get a great workout. Sgt Pepper's Dueling Pianos puts the woo in woohoo! If you have 20 or more guests, a delicious, all-you-can-eat buffet is offered along with stellar adult comedy entertainment. There is a wide variety of menu options, each designed to cater to your specific choice of pleasure. 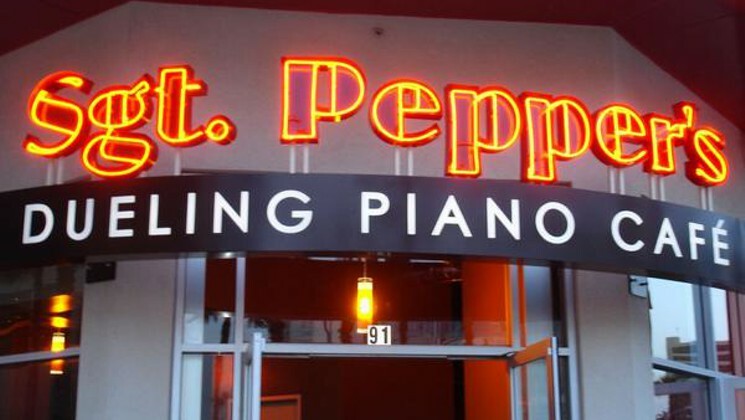 Located conveniently at The Pike in Long Beach, one block north of Shoreline Drive, Sgt Pepper's Dueling Pianos can be found at 91 South Pine Ave, Long Beach, California. Want to get a heads up on all the fun before it happens? Sign up for their mailing list! 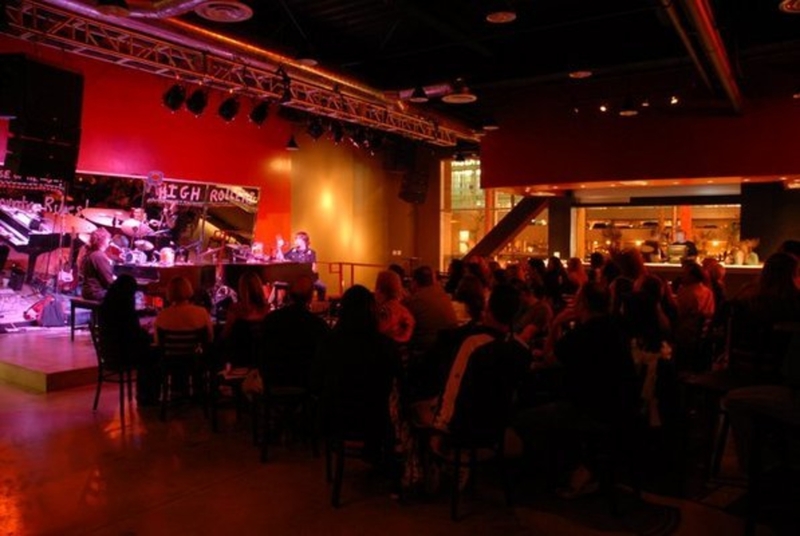 If singing, partying and enjoying fine beverages with a group of other fun-loving adults is an evening you long for, check out Sgt Pepper's Dueling Pianos! Two bacon-wrapped shrimp skewers, four chicken satay skewers, two beef kabob skewers & calamari. Buffalo wings, sliders, hotzarella styx & zucchini styx. Chicken, black beans, corn, red & green bell peppers, cheese & onions fried in a flour tortilla. Turkey, ham, bacon, American & Swiss cheese, mayo, crisp lettuce & vine-ripened tomato stacked high on three pieces of toasted sourdough bread. Grilled chicken breast, bacon, cheddar cheese, avocado, crisp lettuce, vine-ripened tomato & red onion. served on a French roll. Bacon, avocado, mayo, crisp lettuce & vine-ripened tomato. served on toasted sourdough. Blackened chicken breast with cheddar & jack cheese, avocado, crisp lettuce & vine-ripened tomato. served on a French roll. Mixed greens with blackened chicken breast, jack & cheddar cheese, corn, black beans, avocado & vine-ripened tomato. served with chipotle ranch dressing. Mxed greens, topped with chopped turkey, ham, crispy bacon, jack & chedder cheese, avocado & vine-ripened tomato. served with ranch dressing. Pepper jack cheese, chipotle mayo, crisp lettuce, vine-ripened tomato & red onion. Swiss cheese, avocado, mushrooms, mayo, crisp lettuce, vine-ripened tomato & grilled onions. Crispy bacon, American cheese, barbecue sauce, mayo, crisp lettuce, vine-ripened tomato & red onion. Lightly breaded chicken breast sautéed in lemon butter. served with grilled vegtables & choice of garlic mashers, rice or Cajun fries. Two corn tortillas filled with beer battered fish, melted jack & cheddar cheese, pico de gallo, shredded cabbage and homemade baja sauce. served with homemade chips & salsa. Add Quacamoles. Beer battered fish with Cajun fries, tartar sauce & lemon wedge. © 2019 Dueling Piano Shows All Rights Reserved.